At the 2012 Olympics, eight badminton players were disqualified for trying to lose on purpose. Instead, the Olympic athletes impersonated bumbling beginners—serving into the net, missing easy returns, and failing again and again to sustain a rally. The crowd booed, the referees fumed, and commentators grieved for the poor paying customers, who had inadvertently bought tickets to a farce. In a recent post, the inimitable Jeff Kaufman asks an interesting question: What if all athletes everywhere suddenly caught losing fever, and began pursuing their own defeat? Would the resulting games all be as boring and self-defeating as badminton was? Or would some of these reverse-sports be fun and competitive in their own right? In short, how would games change if we all played to lose? It’s clear how to lose a soccer game. Score as many goals as you can on your own net, and prevent your opponent from scoring on their own net. So we expect the game to look a lot like regular soccer, with the goals switched. But there’s a complicating factor: On kickoffs, each team must start on their own side of midfield. That gives a huge advantage to the kicking team. One player taps the ball forward; another quickly kicks it backwards; and suddenly you’ve got 11 players bearing down on an undefended net. Easy goal. Then, because it’s their goal that was scored on, the same team kicks off again. The process repeats for the entire 45-minute half. Of course, after orange slices at halftime, it’s the opponent’s turn. Starting with the ball, they’ve got 45 minutes to score as many own-goals as they can. We’re left with a weirdly elegant game. Each team gets 45 minutes to score as many goals as possible on their own open net. The team that scores more is crowned winner—or rather, loser. 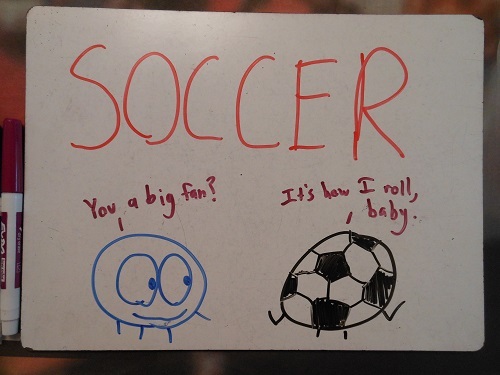 As in soccer, both teams want to score on their own goals. And similarly, play begins with the other team stranded (briefly) on the opposite side of the ice. But there’s a big difference: instead of a centerfield kickoff, play begins with a center-ice faceoff. The winner of the faceoff should score an easy own goal. So the entire game becomes a contest of who can win more faceoffs. Unlike soccer and hockey, which become simplified, shriveled versions of their regular selves, basketball retains its complexity. But there are a few big changes, resulting overall in a positive feedback loop, where scoring once makes it easier to score again. First, after scoring on your own basket, you get the ball back immediately, right under that same basket. Second, “defensive” goaltending (i.e., touching the ball when it is above your own rim) leads to an automatic basket. Thus, for college- and NBA-caliber players, you don’t even have to score, per se. Just put up a shot and then goaltend. Third, the backcourt rule makes it very hard to change possession. You can’t just dribble the ball back onto your own side of the court. 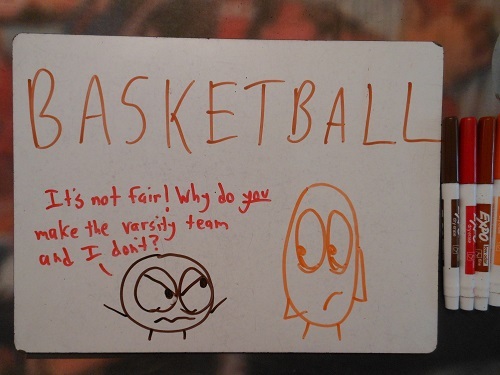 Instead you have to somehow bounce it off an opposing player (or try shooting from the far side of the half-court line!). Based on all this, it might sound almost impossible to stop a team once they get on a scoring streak. But there’s one key balancing factor. In standard basketball, a team has only ten seconds to get the ball across half-court. In our reverse basketball, this effectively creates a ten-second shot clock. Once you inbound the ball, you have only ten seconds to score on your own basket, before you automatically give the ball up. 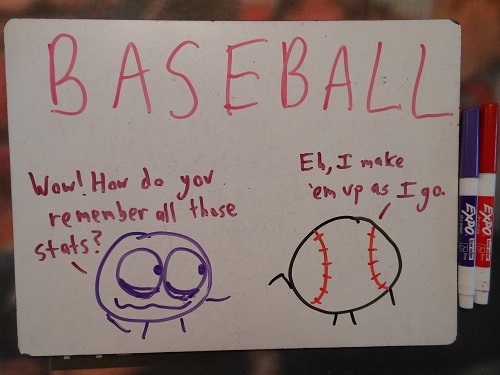 From the start, reverse-baseball is doomed to fail. If it’s possible to force the other team to score, then the score will climb infinitely, and we’ll never get out of the first inning. And if it’s not possible, then you’ll be trapped in a scoreless tie for eternity. 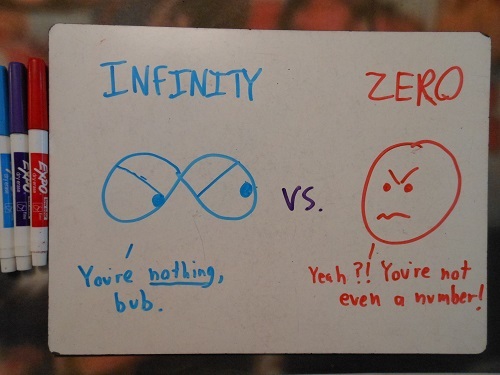 So which will it be—infinite runs, or zero runs? First thought: The pitcher will just hit (or walk) the batter every time, putting him on base. This leads to infinite runs. Second thought: If the batter just swings at every pitch, even if it’s terrible or coming right at him, then he’ll always strike out. That means a scoreless tie. Third thought: If the catcher doesn’t catch the third strike, then the player isn’t technically out yet. In theory he should go to first base. So we’re back to infinite runs. Final and conclusive thought: If the batter simply leaves the playing field instead, he’ll be called out. So we’re back to a scoreless tie. Because you can’t force the other team to score touchdowns or field goals, we’re left relying on the rarest and weirdest of football scoring plays: the safety. A safety, worth two points for your opposition, occurs when you carry the ball into your own end zone. Reverse-football is a game of safeties. Let’s say the Seahawks kick off. The Broncos start with the ball, and commit a safety on the first play of the game. (Hey—this sounds familiar!) 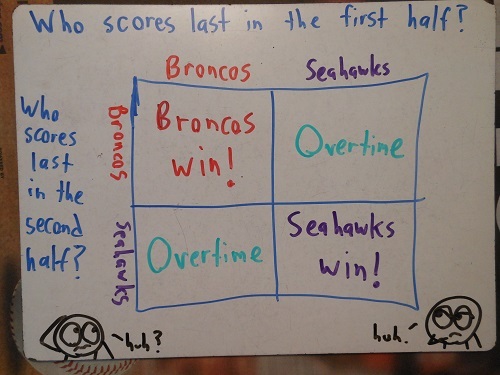 Now, the Broncos are forced to kick the ball to the Seahawks, who score a safety of their own. The ball goes back and forth, the teams exchanging safeties for the entire half. When the dust settles, either they’ll be tied, or the Broncos (who started with the ball) will have scored one extra safety. If the game goes to overtime, then the recipient of the kick-off (and thus, the almost-certain winner of the game) will be decided by a coin flip. Reverse-football boils down, in the end, to one surprising element: clock management. Your surest path to victory is to make sure that you score the last safety of each half. And that means carefully monitoring and controlling the time that elapses on each possession. Yes, this is just a silly thought experiment, a flight of fancy. But it’s something more than that, too. 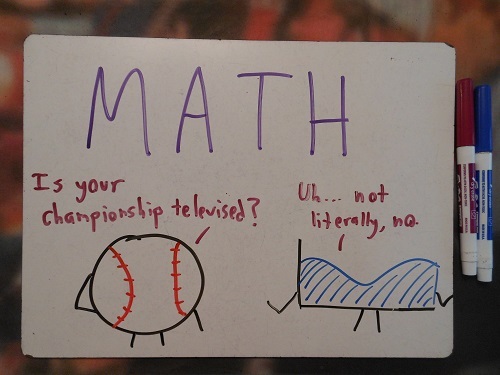 It strikes at something deep in the nature of sports—and, weirdly enough, of math. In sports, you lay down a system of rules, and a living game emerges. 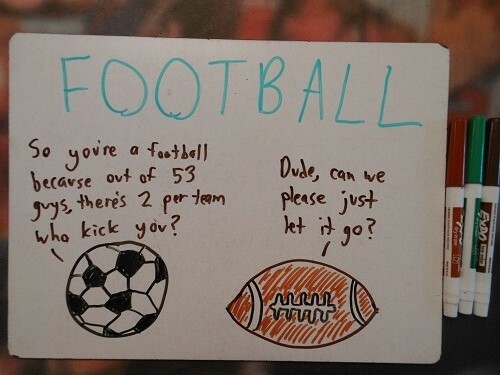 Sometimes those rules are elegantly simple—think of soccer or tennis. Sometimes those rules are complex, and must be endlessly reworked and gerrymandered to ensure that the game stays fair and fun—think of baseball or football. Within those rules, there’s room for innovation. New strategies. New techniques. Design the right framework, and you create a platform for ingenuity that can sustain human creativity for centuries. So it is with math. You lay down a system of axioms, and a living body of truth emerges. 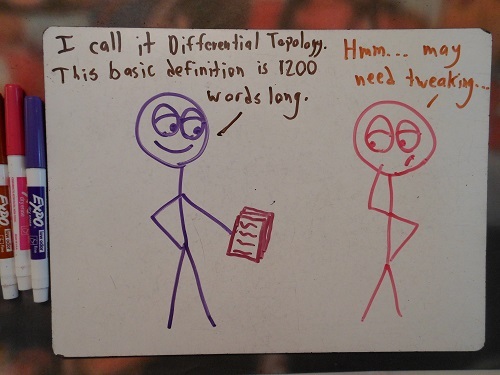 The initial axioms may be elegantly simple (ah, sweet Euclidean geometry) or fiendishly complex (I’m glaring at you,differential topology), but either way, there’s room to invent. To explore. As in sports, the right framework can sustain human creativity for centuries. In the “playing to lose” thought experiment, we’re tweaking one crucial rule in each game—the criterion for victory. This creates a brand new game, the evil twin of our original. To analyze these reversed games takes knowledge of the rules, intuition for strategy, and the ability to play out hypotheticals in your mind. It’s a little like math. Mathematicians modify existing ideas to create new ones, and play out the logical consequences of simple changes. 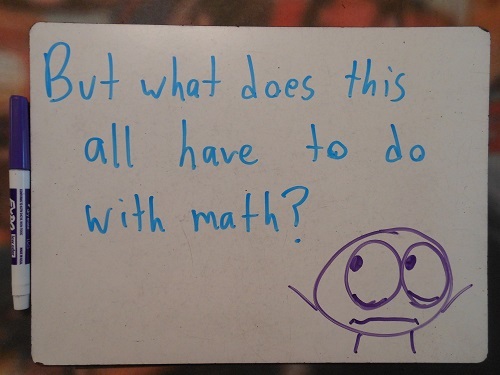 In some sense, math itself is the weirdest and most elegant game of all. P.S. You should totally check out these two soccer games—one where a team protested refereeing decisions by scoring 149 own goals, and another so amazing that my words cannot do it justice. 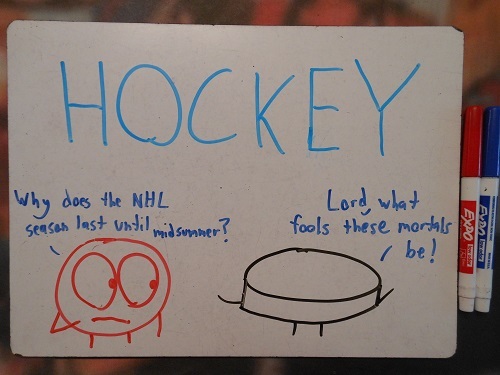 Interesting, however I think you’re analysis of hockey is flawed. Faceoffs are rarely clean wins, often taking a second for one of the teams to end up with the puck. 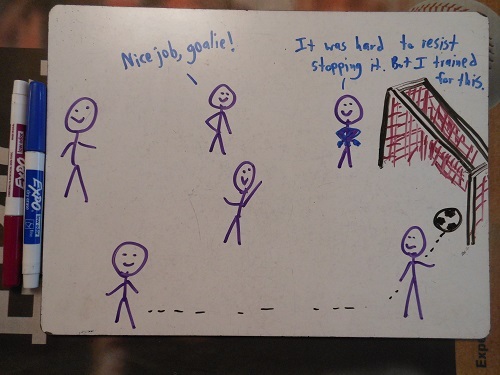 In that time, players can easily cross into the opponents territory to defend the opponents net and make scoring far more difficult (it can be shockingly difficult to score an empty net goal). I think the game would end up being surprisingly exciting, and it would increase scoring…don’t let the NHL read this…they might actually try implementing it. Also, you’re probably right about keeping this hush-hush, lest the NHL try it out. They’ve gotten weirdly experimental since the ’05 lockout. I don’t really know anything about American football, but couldn’t the team that has just scored kick the ball high into the air, then run behind the opposition to stop them un-scoring? Also, in any of these, are there ways to commit a foul in order to waste time and get into a defensive formation? Kicking the ball high is a clever idea, but if you tried that, the other team could just catch the ball and end the play immediately. Then, on the next play, they could score a safety. And yeah, now that you mention it, fouls would be a huge issue in basketball. Committing a foul would be a great way to get the ball back onto the desired side of the court. The only thing stopping you from doing it all the time is that you wouldn’t want too many of your players to foul out (i.e., be ejected because they committed 6 fouls). James is on to something. In the NFL, teams would try onside kicks rather than kicking deep. (If they recover the onside kick, they can open up a bigger lead; if not, they give up the same safety they would have anyway). Thus, there would be more variance than suggested above. I think this only would come up at the kick at the start of the half, where you’d definitely want to try an onside kick. Actually, you can do an onside kick following a safety, it is just from the 20 instead. I have actually seen it done when a team was down by 4 and had 4th and long deep in their own territory, and the figured they had a better chance of recovering the onside kick than converting on the long 4th down. Interesting perspective. If there’s a game out there, someone has thought of how to make the losing variant (take losing chess, for example), and of course, they employ quite different strategies. I lost The Game, by the way. It would be really hard, I agree, but of course, not impossible. If I find someone who’s willing to try it with me (which, at the moment, is absolutely no one), I might give it a try. The rules of the real losing chess (sometimes called “suicide chess”) make it so that the game is actually playable; since the aim is to have all your pieces captured by your opponent, mandatory capture is often put in place, otherwise no one will take any pieces. The Official Rules of major-league baseball are 119 pages long. The FIFA Laws of the Game are 138 pages long. Granted, the typography is way looser for the soccer rules, but things aren’t so different as you paint them. My favorite baseball rule is 5.09g, which says if a pitch lodges in the catcher’s or the umpire’s mask and remains out of play, all runners advance one base. It’s one method of getting on base without hitting the ball that virtually no one thinks of. Yeah, I’d imagine in a world of anti-baseball, the umpires would try to keep that on the DL, lest the pitchers start gunning for their faces. 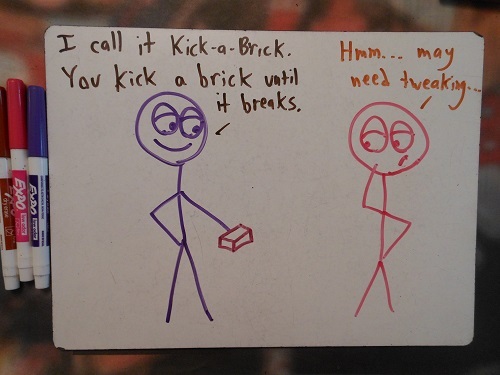 Sounds like that works like a balk, right? Wouldn’t get a runner on base, but does help runners advance. In the (American) football example, since scoring last is a priority, there could be incentive to advance the ball, even score first downs, to run down the clock. Yeah, good point. I think you’d have to simulate a game to get a sense of when it’d be useful to try prolonging a possession like that. Reblogged this on Keep Calm & Pretend it's in the Lesson Plan. This post is so beyond-cool I have no words for it. Let’s hear it for innovatIon in mathematics and the world! Thanks – glad you enjoyed it! This is a truly awesome post. Keep up the good work, Ben! Also, I’d like to draw your attention to antichess (Link: http://en.wikipedia.org/wiki/Losing_chess) which is the reverse game for chess. It is quite popular and often actually played! I know I’m rather late to this particular party, but I thought you’d like Barbados v Grenada in the 1994 Carribean Cup. It’s another beautiful real-world illustration of the unexpected consequences of seemingly innocent rules.